And he lost just four games in an hour and 42 minutes on court on Thursday to wrap up a 4-6 6-3 6-2 6-2 victory. How do you stop 'King of Clay' Nadal? Nadal is the hot favourite to win the second Grand Slam of the year, having dominated on the red clay since making his Roland Garros debut in 2005. But the 16-time major winner looked in danger of being beaten here for only the third time in his career, trailing a set and break on Wednesday to an opponent who had never previously been beyond the last 32. Schwartzman started the match aggressively, hitting 20 winners as he became the first player since 2015 to take a set off Nadal in Paris. However, his fearless approach was completely ruined by the rain delays and allowed Nadal to regain control. The match had already been stopped for an hour on Wednesday, with Nadal trailing 6-4 2-1, before play resumed at 17:28 BST. The players only managed another 20 minutes on court before more rain forced them off for the night, but it was enough for momentum to switch in Nadal's favour. Nadal returned with his famed forehand finally firing on all cylinders, earning back-to-back breaks to move within a hold of the set. He led 30-15 when play ended at 18:37 BST, returning at 11:00 BST on Thursday to wrap up the set and level in a matter of seconds. "After the first rain delay, the match changed a lot because I played more aggressive with high intensity and things were more on my side," Nadal said. "Before it I was not opening the court with the backhand. I was playing too behind the baseline. He was taking the ball earlier than me. "I had the feeling he had control of the point too many times to have the chance to be successful." Schwartzman is a rare sight in the modern men's game, standing just 5ft 7in, but his stature has not prevented him rising to a career-high 12th in the world rankings. The 25-year-old possesses a stinging forehand and used it aggressively to rock Nadal on Wednesday. A day later, it was rarely used as effectively. From the moment Nadal took the second set, it looked unlikely Schwartzman would earn a first win in six attempts against the man at whose academy he had trained. Nadal only dropped one point in the opening two games, going a double break up for a 4-1 lead. Schwartzman missed four break points at 5-2 as Nadal eventually held serve to lead for the first time with approaching three hours on the clock. The freedom with which Schwartzman had played in the first set had disappeared, errors which had been rare becoming increasingly regular. An easy smash into the net midway through the fourth set characterised his problems, a total of 25 unforced errors compared to eight winners in the final two sets underlining the pressure being put on by Nadal. Nadal missed a match point on Schwartzman's serve and spurned two more in the following game. Schwartzman also missed three break points before his brief revival was ended when Nadal took his fourth match point to win in three hours and 36 minutes. Nadal's game appeared more suited to the warmer and quicker conditions on Thursday, although he believes the change in weather did not have a major impact. "I was playing poorly, and my opponent was playing better. You can't always find the excuses or positive things about the external things," he said. "You have to find causes within yourself. The changes were not the sun or the rain." Del Potro was in tears at the end of his match against Cilic as he celebrated reaching his first French Open semi-final since 2009. The pair had resumed their quarter-final level at 5-5 in a first-set tie-break. Del Potro quickly won two points to settle the set before being pegged back as Cilic levelled at the second time of asking in the second set - having made four unforced errors when serving for the set at 5-4. The Argentine was a break down in the third but turned it around as the errors started to creep in for Cilic, who was bidding to reach the last four for the first time here after falling in the quarter-finals last year. Del Potro found the breakthrough at 5-5 in a tight fourth set, when Cilic sent a backhand long to give him a break and he went on to serve out the match. "It's been a long time without a good feeling with my body," an emotional Del Potro said in an on-court interview. "I had three surgeries on my wrist and I was close to quitting the sport." It is an eighth straight win for Del Potro in his meetings with Cilic. Del Potro has won two of his past three meetings with Nadal. However, he was beaten in the most recent - the US Open semi-final last year - and has lost nine of their 14 matches overall. Why does Nadal reign as 'King of Clay'? 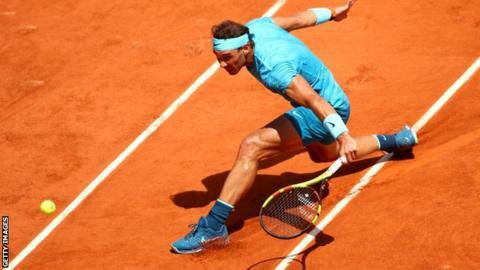 Read more on French Open 2018: Why does 'King of Clay' Rafael Nadal reign supreme?